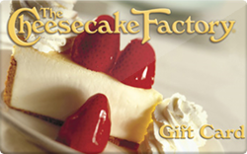 Cheese Cake Factory is a restaurant that specializes in cheesecakes for dessert. They carry more than 40 legendary cheesecakes and desserts. Buy a discounted gift card to save on top of their sales and promotions.